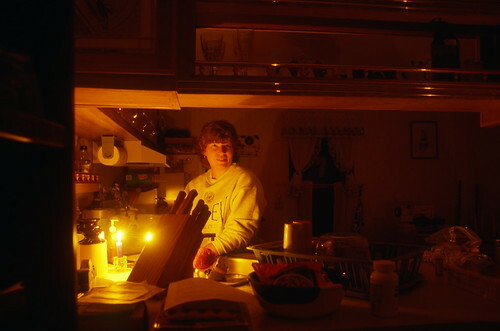 Dishes by candlelight, originally uploaded by The Bacher Family. The winter of 1995-96 was a stormy one in our little home at the foot of Mount Rainier, with lots of rain, snow, wind, and power outages. I took this photo as Kelli worked in the kitchen by candlelight. Wish I could remember if it was on a tripod or just a lucky handheld shot; either way, it makes a neat portrait.